What makes a project successful? Team work! That's why you need the Real Estate "Power Team" of Coldwell Banker. Our team is known for it's willingness to go that extra mile to assure you the "best deal", all based on honesty and integrity. T.E.A.M. means- together everyone accomplishes more! Your real estate "PERFECT PARTNERS" are the "POWER TEAM"! 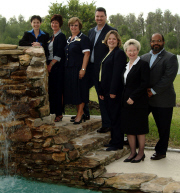 We are a team of 6 full time Realtors working together for you! You'll never be without someone to set appointments, market your home or answer all your questions. So if you need a rental, an apartment, vacant land, a single-family home, to sell a home, or to buy from any builder call the Real Estate "POWER TEAM" of Stacy Birr Customer Care Manager, Regina Ramalheira, Barbara Baker, David L. Birr P.A., Vanessa Hamwey, Fran Sigle C.R.S.,and Patrick Burgess. REALTORS ® Se habla español!